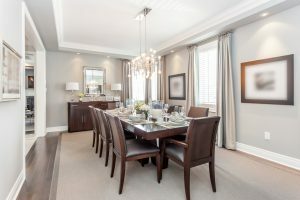 Your dining room is a special area of your home, where you gather for family dinners and special occasions. You might not use the room every day, but when you do, you want it to be a space where great food is enjoyed and memories are made. However, if the lighting in your dining room isn’t quite right, people may not feel quite as relaxed while sitting at the table. At Hacienda Lighting in Scottsdale, we can help you find the ideal dining room light fixtures for your home. If you have a china cabinet or artwork in your dining room, it’s important to highlight them with the right accent lighting. Wall sconces can add a layer of light to the lower portion of the room, and track lighting will draw attention to the paintings and photographs on the walls. For your fine china, consider adding LED-strip lighting to the cabinet, which will give guests a great view of your bowls and dishes. When you need new dining room lights, whether it be a chandelier or new sconces, Hacienda in Scottsdale can help. Shop online or visit our showroom today!